Brief Synopsis: A new mystery is afoot as Dr. Fate's helmet returns to the world. Issue Notes: Booster Gold is in this issue, but only as a corpse. "Week 18, Day 4." 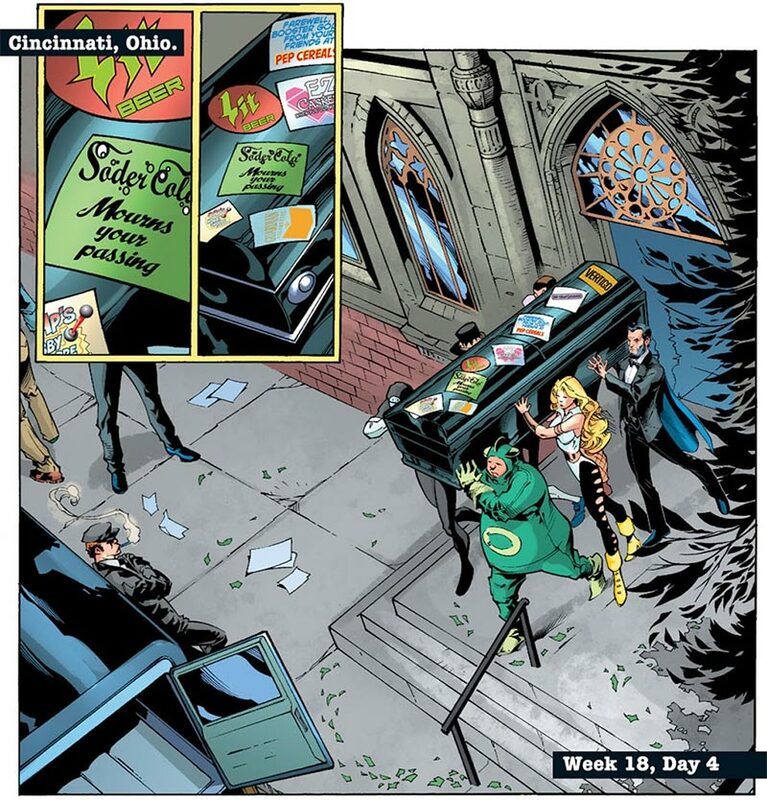 Booster Gold's funeral is being held in Cincinnati, Ohio. His casket is covered in stickers from corporate sponsors including Big Belly Burger, Cap's Hobby Shoppe, EZ Caskets, Guardian Cigarettes, Lit Beer, Pep Cereals, Soder-Cola, and Vertigo Comics (a line of comic books owned and produced by DC Comics). Booster's pallbearers are, on the left, Mindgrabber Kid, Beefeater II, the Odd Man, and on the right, the Blimp (from the Inferior 5), Yellow Peri, and Honest Abe (an Abraham Lincoln impersonator making his first DC Universe appearance). All of the pallbearers are very minor DC Universe heroes, making Booster Gold an A Plus-list hero by comparison. Skeets II and Clark Kent discuss the reasons that Booster Gold's funeral is being held in Cincinnati, Ohio. Kent comments that Booster has never been to Cinicinnati, which is true. Booster has however been to Ohio. In fact, it was in Ohio where Booster Gold joined the Justice League in combating Doomsday in Justice League America #69. When Odd Man expresses ignorance about Booster Gold, Beefeater supplies him with information. Of all of Booster's pallbearers, only Beefeater has ever met Booster previously. (Although Blimp did appear in a panel also containing Booster in JLA: Welcome to the Working Week, the two were not shown to have met one another.) All of Booster's other pallbearers apparently took the job based on a job listing on the fictional website for want-to-be heroes, Herolist. Booster first met Michael Morice in Justice League International Annual #3 as the Embassy Chief of the Justice League International's United Kingdom branch office. Though they were never seen together on-panel, Booster may have met Morice as the Beefeater at a party in Justice League America #57. FIRST APPEARANCE: First appearance of Daniel Carter, ancestor of Michael Jon Carter, aka Booster Gold. Daniel is attending Booster's funeral service wearing a JLA t-shirt, indicating that Booster's affinity for superheroics is perhaps genetic. Boosterrific Review: The funeral of Booster Gold interrupts what is otherwise a somewhat confusing but necessary chapter in the story of the redemption of Ralph Dibny. This issue is full of some of the most obscure characters in the DC Universe, and as a result is likely incomprehensible to new readers. Not a bad issue, but by no means is it very accessible, either.